Did your client require a foot or leg amputation because of undetected or undertreated peripheral arterial disease (PAD)? 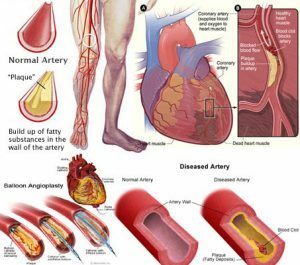 Just as the build-up of plaque (atherosclerosis) occurs in the coronary (heart) arteries (called coronary artery disease), it may also occur in the arteries of the legs. This accumulation of a sticky material called plaque in the extremities is called peripheral arterial disease. As plaque accumulates in the arteries, and the walls of these arteries become more and more narrowed, a reduced lack of blood flow and oxygen (called ischemia) results. Pain usually follows because the amount of oxygen being delivered to the legs is not sufficient to keep up with the amount of oxygen the legs need. The risk factors for PAD are the same risk factors as for coronary artery disease (CAD). Smoking is the risk factor most predictive of PAD due to nicotine causing the vessels to constrict and promoting clot formation. 80% of people who report symptomatic (painful) PAD have a history of smoking. PAD is a major risk factor for a foot or leg amputation, particularly in a diabetic patient. A diabetic patient with PAD is 5x more likely to have an amputation than a non-diabetic patient with PAD. An amputation is a treatment of last resort that typically occurs when the leg has a dry gangrene ulcer and the limb is unsalvageable. Dry gangrene refers to a blackened and shriveled wound that develops because of inadequate blood flow; these wounds most commonly occur on the toes and feet. Pain usually is the first sign of PAD. People initially may present with intermittent claudication. This pain occurs when a person is participating in moderate to heavy activity but then resolves with approximately 10 minutes of rest. Intermittent claudication typically occurs when the involved artery is approximately 50% occluded (blocked). As the narrowing of the artery worsens, nocturnal (nighttime) pain develops. With nocturnal pain, a person’s pain occurs when lying in bed; the elevation of the legs decreases the amount of oxygen being delivered and contributes to this pain. Rest pain occurs in the absence of any activity and even with the legs placed in a dependent, non-elevated position. Rest pain generally signifies severe blockage of an artery (typically > 90% vessel occlusion) and is referred to as critical limb ischemia. The treatment plan for PAD involves many components: maximizing the perfusion of oxygen and nutrients, minimizing the infection risk, assessing wounds for deterioration, and reducing the level of pain. Oxygen delivery can be improved to the ischemic leg through surgical interventions, medications, hyperbaric oxygen therapy, intermittent pneumatic compression device usage, and lifestyle changes. Many people experience these types of pain but feel it is part of the normal aging process. A physician needs to conduct a thorough history and physical to uncover PAD. An immediate referral to a vascular surgeon is appropriate if someone experiences rest pain or if the pulses in the feet (pedal pulses) are not heard with a Doppler device (a machine that uses ultrasound waves to estimate blood flow). Peripheral arterial disease (PAD) must be diagnosed and treated or the limb could suffer severe damage, resulting in an amputation. If it is found that medical negligence caused a delay in diagnosis and treatment, there will be a case of medical negligence. Med League provides physician expert to review these types of cases. Call us today or complete our online inquiry form if you need an orthopedic expert witness, Endocrinology expert witness, Vascular Surgeon expert witness or a wound care expert witness.